Are SQL Saturday’s Worth It? 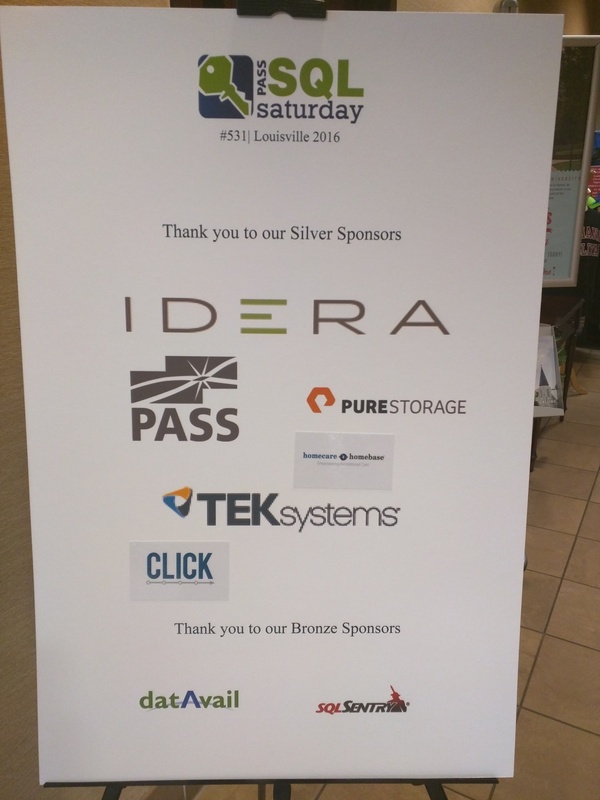 This past weekend I was fortunate enough to be a part of Louisville’s (for those local the ‘ville) SQL Saturday event held at Indiana Wesleyan. Most of you who end up on this site are probably familiar with it, but for those that aren’t familiar with SQL Saturday events you can check out their site here. Now to put on an event like this is nothing short of an incredible effort from volunteers, sponsors, speakers, and attendees. Being able to help co-organize the one here in Louisville has been a humbling yet gratifying experience. Let me see if I can break it down a different way for you, the reader, who may not have had the opportunity yet to volunteer or attend such an event. You can see these people usually with matching shirts on and a lanyard with their name and a ribbon that only says “volunteer.” In the past when I’ve attended such events I knew people helped out to put something like this on, but never in my wildest dreams did I envision all that it took until I volunteered. Volunteering is not for glitz, glamor, or glory. Instead volunteering is what helps the cogs in the wheel move to get the steam engine running down the track. It is the staple of helping afford the opportunity for free learning to attendees and colleagues in our field. Many, many, and many hours go into planning and organizing an event; if you attend one of these events make sure you seek a volunteer or organizer out and say thank you for their time; they are doing this for free and on their own time away from their families. Mala Mahadevan (B|T) as a founding organizer of our event I thank you for allowing me to be a part of it these past few years. 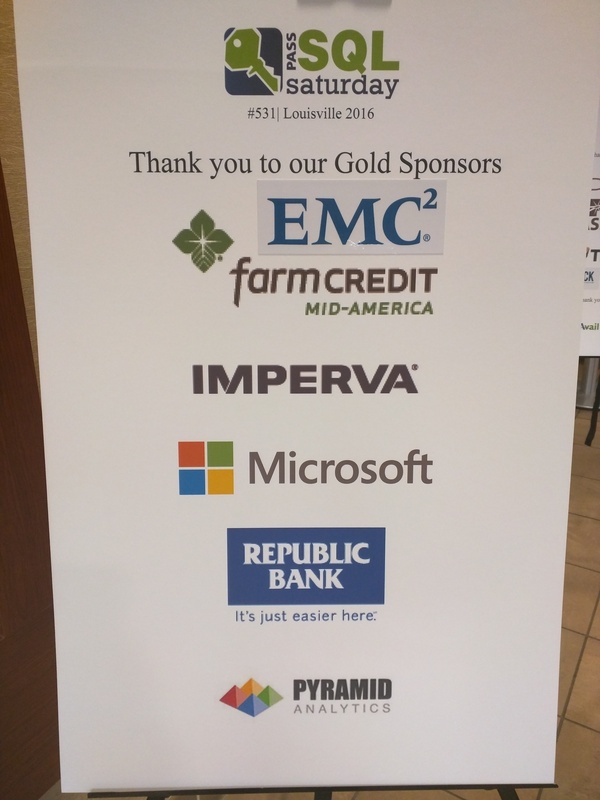 Over the years, SQL Saturday Louisville has been blessed with some great sponsors. For the previous two years, John Morehouse (B|T) and I have taken great pride in working with some stellar companies. Without them, we would not be able to do what we do which is concentrate on the attendees and helping people learn. A major thank you for all of their contributions and it is always a pleasure to work with all of you. It always amazes me at the number of speakers we have who send in sessions to our event. These speakers are people from all over the U.S. who are willing to travel and give their time so attendees can learn. Getting to spend time with each of them is not always an easy task, but always thankful to catch up with many friends at the speaker dinner. It was awesome to see the attendees interacting with the speakers asking their questions and getting insight into the variously presented topics. And, because of so many good sessions to choose from, there was a buzz in the air. As is the case with the volunteers mentioned above, speakers also travel on their own dime, away from their families – a simple thank you goes a long way. Also, for these sessions, I do want to point out that feedback cards are provided; please please please take a moment and make sure you provide good insightful feedback to the speakers. Each speaker uses this feedback to improve their sessions or have take-a-ways on what may or may not have worked. Yes, folks, these are important! I won’t list every speaker we had; that is not the intent of this topic. But I will take a moment and say to each and every speaker who attended SQL Saturday Louisville 531 we thank you. Two words – – THE PEOPLE. As I have stated, these last two years has been nothing short of amazing. Seeing light bulbs go off with attendees who are learning from some of the best, and having discussions with attendees is why we do what we do. 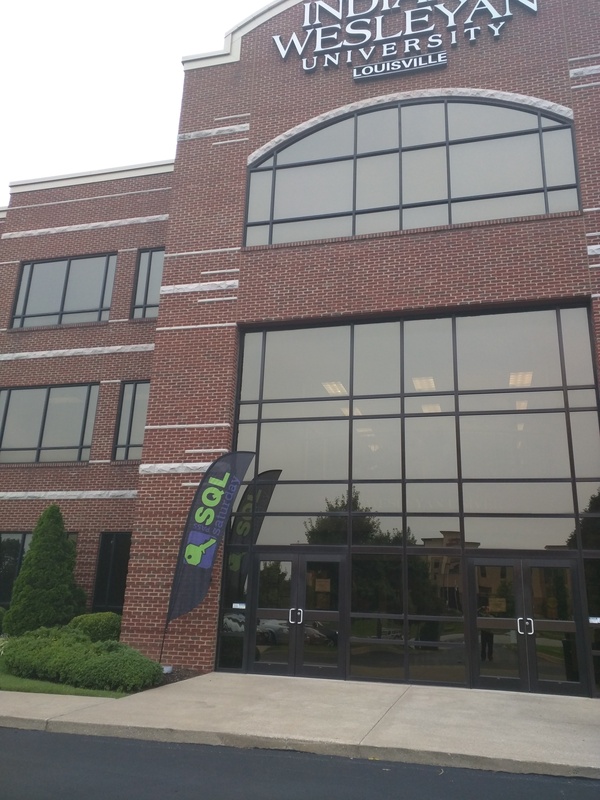 When individuals come to us stating it was their first time at the event, and they had no idea that there is a local Louisville SQL User Group opens the doors to help reach people in our tech community. Steve Jones (B|T), who is part of my Fab Five, talks about Dreaming of SQL Saturday. If you have not had a chance to read his post, check it out. Attendees travel from quite a distance. Which tells me the people are eager to learn. So, the question I opened with “Is SQL Saturday Worth It?” Considering what I know now versus what I knew then the answer is yes. Personally, being a product of these types of events, I am living proof of what can grow from the SQL Community. Whether you volunteer, speak, sponsor, or attend, all of these make the wheel turn. It’s a team effort with a lot of hard work. So, next time you attend one of these events, please don’t take them for granted. Here is to continued learning, as we move forward to grow this community! The doors close, lights turn off, and cars begin to pull out of the parking lot. 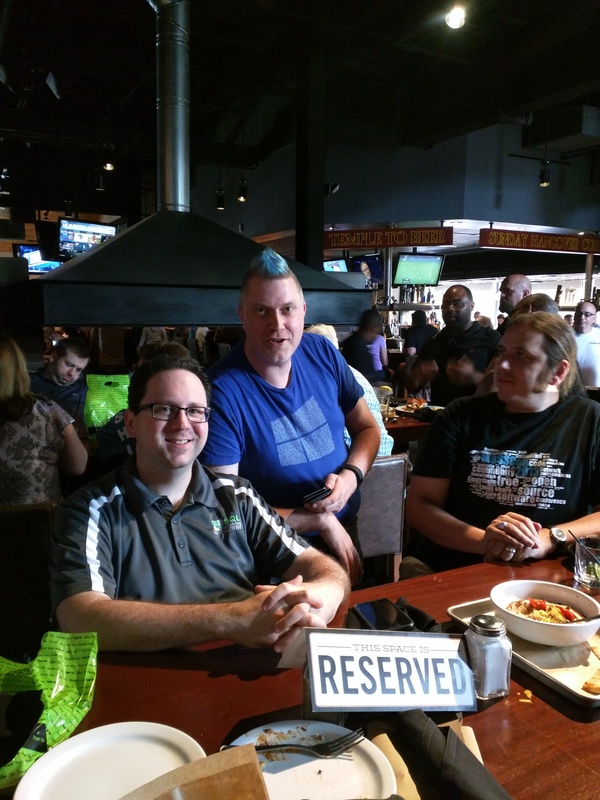 Another SQL Saturday event has come and gone, but this time it was different. The reason for this was from the hard work, effort, countless hours, and collaboration that took place. This past year I wanted to embark on a journey that I hadn’t done before which was volunteering for a SQL Saturday event. Malathi Mahadevan (B|T) afforded me this opportunity to get involved along with John Morehouse (B|T) . Little did I know what I was about to embark on. Listen, most attend these events by showing up and listening to a talented speaker pool. After the event attendees stick around for a raffle, and share some laughs with friends. I know because I’ve attended several of these events; I’ve also spoken at a lot of events other than SQL Saturday’s and given presentations. In those times you get to talk with other speakers, attend some nice dinners, and kick back with some deep conversations. What is missing? Enter stage left > the twitter wall. Something new that I have not seen before was, what became, the infamous twitter wall. The idea stemmed from a colleague/friend of mine John Morehouse. One of the cool things that I liked about this idea was seeing all the attendees thoughts as they were sitting through the sessions. 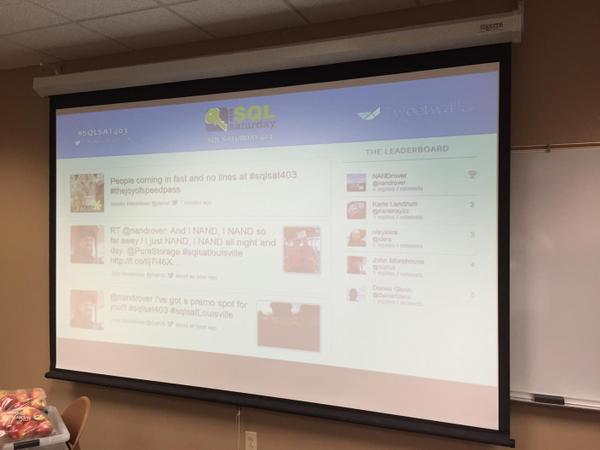 The #SQLSat403 was generating quite a buzz, this was proof that what was happening in Louisville was a great thing. The vendors located in this area were pretty stoked about the twitter wall as they were getting some love as well! Those are some pretty encouraging comments. As with anything, our group realizes that we had hiccups. Some may not have even been noticeable, but the organizers noticed them. Guess what, we are making a list and looking for ways to continue to improve on this event. There is a buzz going on here in the city of Louisville around this event; know that we have a dedicated team in place that will continue to work hard in order to make this one of the best events around. If you attend one of these events in the future, anywhere in the world, I implore you to walk up and thank the volunteer. I know the group I am associated with are an amazing bunch, and that will go for the rest of the organizers worldwide. It’s been an honor and privilege to serve; looking forward to many more. How about you? Will you volunteer? Will you speak? You can check out a full schedule on the SQL Sat website here. To my fellow organizer – it truly was an amazing ride and I thank you for the opportunity. To the attendees – it was a blast to see you all along with seeing a lot of light bulbs go off and discussions we had. Hope you guys had as much fun as I did. To the speakers – spent a lot of quality time with a lot of you and I look forward to coming to your venues to speak in the future. Thanks for investing time in our community so others may learn. To the vendors – we couldn’t have done it without you; look forward to cultivating that relationship with you as we move forward. It’s game time folks; let’s get it done. If you reach one then it is a success.